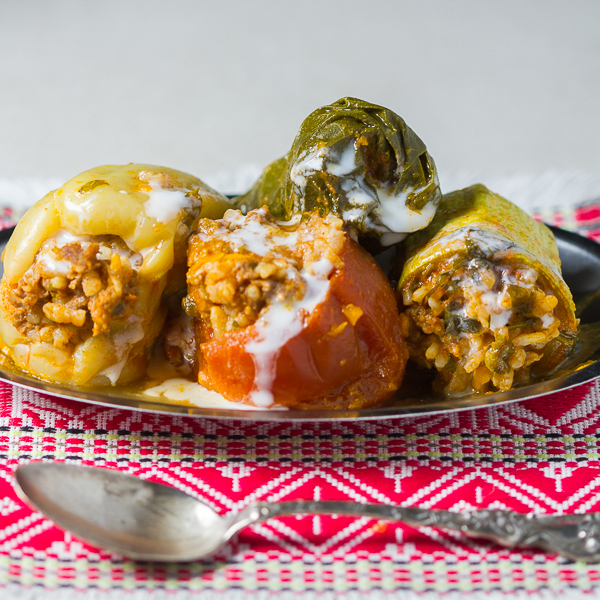 Dolmas, or stuffed vegetables, is maybe the most recognizable dish from the Balkans. Ground beef is mixed with onions, garlic plus spices, and used as a filling for several veggies (zucchini, onions, tomatoes, peppers and Swiss chard), until it’s all finally baked it in a tomato based sauce. I’ll paraphrase myself when I tell you that there are several types of stuffed vegetables, or dolmas, in the region. 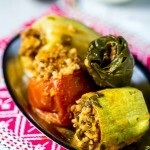 Dolma is really a name for the filling, but in vernacular for a long time it’s been known as the entire filled veggie. 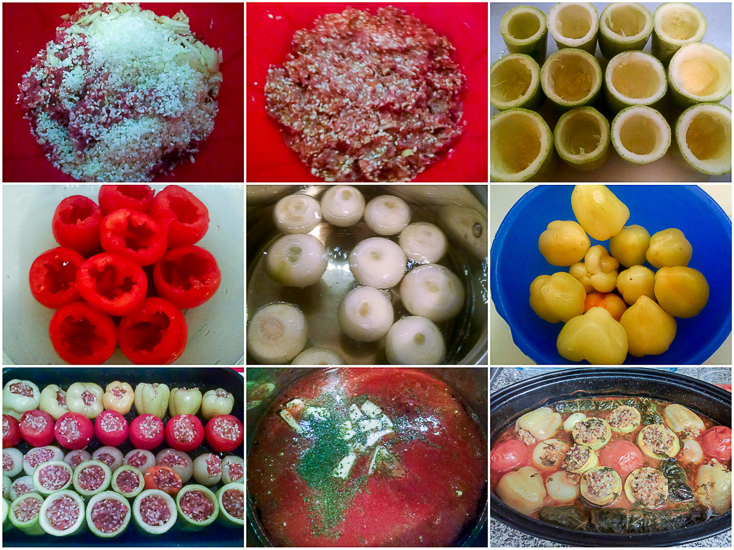 Today’s recipe is for what’s commonly known as šarena dolma, or colorful stuffed veggies. The combination of several different fresh vegetables together in a pan, the dish looks especially vibrant… and thus the name. One surprising fact is that even though all these vegetables are essentially simmering in tomato sauce in a covered pan in the oven, each keeps its own flavor. 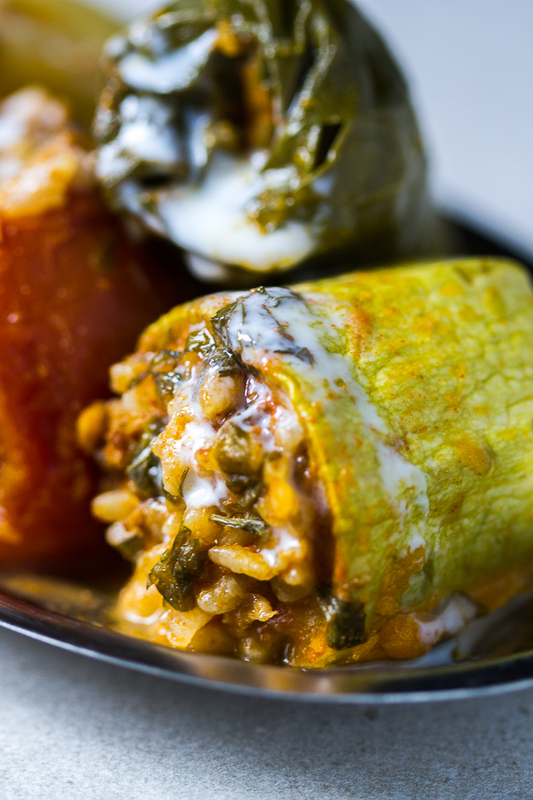 Therefore stuffed onion (or sogan dolma), is different than the stuffed tomato, which is different than stuffed peppers. This delectable dish is perfect when you have guests over as it has something for every taste. Also, it’s great for potlucks or picnics. I’m finishing today’s story here. With the intensive filming schedule I haven’t had time to write a text worth your while. However, since we’re talking about videos, my sister and I are working on finding a way to host them on the site. Currently they’re too big, and we’re exploring options. Meanwhile, below is a list of the videos that are finished, and links for the FB where you can take a look at them if you haven’t already. If you have ideas of what you’d like to see in a video, jot it down in comments. STUFFED APPLES – Walnut stuffed apples or tufahije (singular: tufahija) are a quintessential Bosnian dessert recipe. When these no-frills ingredients (walnuts, poached apples, simple syrup and some whipped cream) collaborate you get a very elegant treat. RUSSIAN SALAD – This egg, veggie, meat and pickle salad topped with mayo is a holiday staple. PHYLLO CHEESE PIE – Phyllo cheese pie is a layered, 60 min, quiche-like, one-pan dish belonging to the family of Balkan pies. It’s made by stuffing phyllo dough with a mixture of cheeses and eggs. POTATO STUFFED PEPPERS – Potato stuffed peppers: crunchy, light green peppers, stuffed with a filling of grated potatoes, onions and spices, and then baked. The result is close to a hash brown in a pepper, prompting you to ask yourself why you didn’t think of this earlier. BUCKWHEAT MINI BREADS – Soft and flavorful buckwheat mini breads further enriched with sunflower seeds. A simple way to inspire you to make your own dough. CHOCOLATE SQUARES – Super easy everyday chocolate squares you can make in under 45 minutes. If looking for a quick dessert that will leave everyone speechless, this is it. CHICKEN BUMP PIE – Here is a recipe for chicken “bump” pie, a simple chicken pie you’ll love. SWEET BRAIDED BREAD – Braided bread with hazelnuts and raisins: a sweet addition to your holiday table. MEAT STUFFED PEPPERS – Simple stuffed peppers. Delicious, hearty, comfort meal. A perfect way to stay strong through the winter. FIG TRUFFLES WITH RUM – Fig truffles with rum. Have you heard a sweeter sentence in your life? Dry figs integrated with chocolate and rum, then rolled in coarsely ground almonds for the win! TRADITIONAL BEY’S SOUP – As if straight out of a Bosnian royalty cookbook, Bey’s soup is a dish you’ll have a hard time forgetting. Luckily this okra delicacy – simmered in a chicken based broth, finished off with a simple roux, then sprinkled with lemon juice as the last touch – is here for your consumption. MOUSSAKA – Moussaka is a casserole-type dish made by layering potato rounds and ground beef, which are then baked together and finished off with an egg, milk and sour cream topping. BEEF PATTIES IN BECHAMEL – Ground beef patties with bechamel sauce recipe is exactly what you think it is: beef patties covered with delicious bechamel, and baked. The result will blow you away! Wash and deseed all vegetables. Make small cups out of each except for the onions and the chard. In a larger bowl, combine all filling ingredients, and mix with your hands until incorporated. Bring water to boil in a small pot and add onions. Boil for 5 minutes and take out. Dip chard into boiling water for 30 seconds and take out. Cool onion, and press lightly in the middle until it falls out and you’re left with a few outside circles. In a large pot, place all sauce ingredients. Bring to boil and turn off. Stuff all vegetables with the filling. Stuff chard as you would stuff cabbage leaves by placing a small amount of meat in the middle, folding the sides in and toward yourself. Place in a deep pan. Heat oven to 395°F. Cover pan, place in the oven and bake for 1 hour. Take the lid off, and bake another 10 minutes. Dolmas!!! I’m making this tomorrow!!! Stay tuned!!! Oh yes, I’m here 🙂 I made this last night and it was so delicious! And much easier than I expected it to be. I am always reluctant to make stuffed anything because it seems like it takes so long to carve and stuff and roll everything. But once it’s made, it’s a one-pot meal. You don’t need any sides, just some fresh bread and that’s it. And you can make it early in the day, run out and do what you need to do, and come back and reheat it a few minutes before eating – a necessity in my life right now. I love that you don’t have to pre-cook the filling before stuffing the vegetables in this recipe. That’s a huge time saver right there. I halved the recipe and followed it exactly, minus the swiss chard because I didn’t have any. I used the dark green (American) zucchini, mini peppers, onions, and plum tomatoes. When I was making the sauce, I was worried that it was a bit watery but once it cooked with the vegetables it turned out to be the perfect consistency. I baked mine covered at 375F (because my oven always seems to run hot) for 50 minutes, then uncovered for the last 10 minutes like you said and in the end I had a delicious meal and a very happy husband 🙂 Thanks again Aida for a wonderful recipe! I just watched a bunch of your Facebook videos! They are fantastic!!! I followed your group. If I could make a request for one, it would be for the hash brown potato pie recipe. I’ve made it several times but I’m having a hard time trying to understand how thick or thin the mixture of grated potatoes, onions, water, and flour should be, both in consistency and when placed in the pan. The photographs are wonderful, but the video can actually show how thick or thin a mixture should be, which I think will be so helpful! I’m so glad you liked it! I agree regarding the sauce, it does look watery, but it turns out just right. What you might want to do when you take it out of the oven also is to pour the sauce over dolmas (and before reheating) to soften the top part which can dry out from baking. Thanks about the videos! I know I’ve commented about the fabulousness of this dish already but I wanted to share that this past weekend I hosted a potluck for about 50 Bosnians and made a triple recipe of these dolmas, a quadruple recipe of your Bey soup recipe, and three of your cheese pies. Almost nothing of my dishes was left, and people were so surprised that a non-Bosnian made some authentic Bosnian cuisine 🙂 So I wanted to thank you again for creating this blog and making Bosnian food more familiar to the rest of the world! Fantastic! You are of course “to blame” for all the success of the potluck. Thanks for letting me know, comments like this always make my day. I’m a brazilian guy. My wife and I visited Bosnia 1 year ago and there we had the best stuffed vegetables ever! (actually, was our first time trying that). 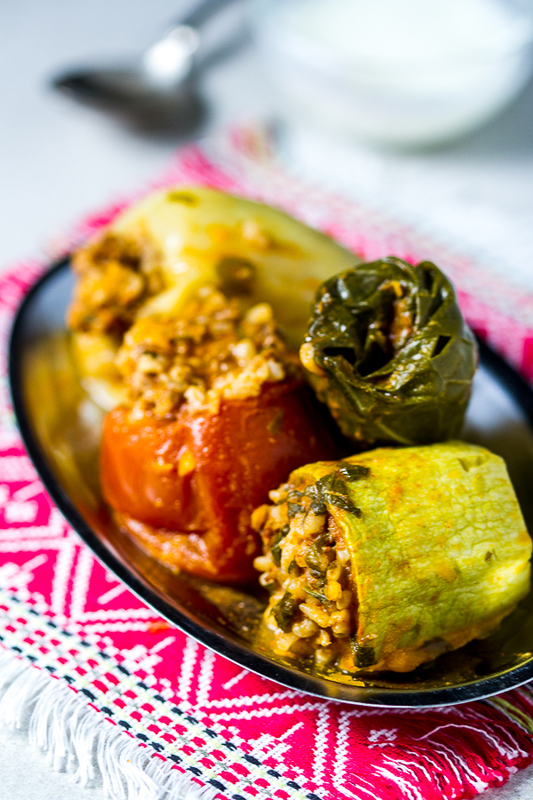 We always said that we have to try to prepare Dolma and we’ve choose your recipe! I just want to thank you to bring again all good memories about one of my favorite dishes in the world! So glad to hear your wife and you enjoyed Sarajevo, and that you have some nice memories from here. I look forward to visiting Brazil one day as I hear you have AMAZING food. Best of luck making dolmas, hope you like them as much as you did when you visited.